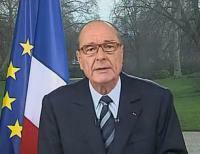 Latest news on President Jacques Chirac's speech to the nation on the CPE, and responses to it. Update: A full text of the speech has been translated here. Force Ouvrier have said that the five main trade unions shall meet again on April 5th, after the day of strikes and protests on April 4th. Several hundred have been protesting peacefully in the Place de la Bastille and Place de la Concorde. The Secretary-General of the CGT union, Bernard Thibault: "[I] will not discuss amendments of the CPE" with the Prime Minister, like Jacques Chirac had proposed to the two sides of industry in his speech. Jean-Claude Mailly, Secretary-General of FO- "incomprehensible" and "not acceptable... Our will be on April 4th, with the strikes and the demonstrations which we still carry out, obviously". Karl Stoeckel of UNL high school students - "a provocation... It would have been necessary to withdraw the CPE to open a space of dialogue"
Jacques Voisin of the CFTC - "ambiguous and unclear"
Francois Bayrou, of rival centre right party the UDF, has said that "it is the first time in history, that I know of, when one promulgates a law by asking that it is not applied. To avoid the crisis, Chirac has taken the risk of ridicule"
Chirac is coming in for criticism for making what some see an ambiguous statement. Sarkozy: "a wise decision, conformity with the wishes of the immense majority of UMP Members of Parliament"
He "believed the First Employment Contract (CPE) can be an effective tool for employment." He said he had also "heard the anxieties that are being expressed by many young people and their parents." "That is why I have asked the government to immediately prepare two modifications to the law on the points which have been at the heart of the debate. The (trial) period of two years shall be reduced to one year. And if the contract is broken, the right of the young worker to know the reasons shall be written into the new law,"
Chirac made a "wise decision" on the CPE, says Nicolas Sarkozy. The secretary-general of trade union Force Ouvrier, Jean-Claude Mailly, considered "incomprehensible" and "unacceptable", the contents of the speech of President Jacques Chirac. He accepts the law, he will sign it into being. He will insist upon 2 major modifications - the employer must give a reason as to the reason for the termination of the contract. Previously the employer did not need to justify a sacking. And, "the probation period of the CPE will be reduced to one year" from two years. He spoke of the need for a debate in the country, around the present value of a university degree, and the links between university and the jobs market. He insisted that he understood the fears of young people, speaking of being waging 'war with on unemployment. He spoke of 'precarite', or job precariosnous and insecurity, of the fears young people had of labour market casualisation. Fundamentally - he is backing the law, but with two modifications. "I understand the refusal of precariousness"
"with the CPE, Domenica de Villepin wanted to offer new opportunities for young people"
Meanwhile hundreds have gathered in the Place de la Bastille. he “understands” that young people are worried but signs the law anyway. he signs the law but asks the employers not to use it right now. they have to wait that the law is modified. What is the point of signing the law then? He asks for a negociation with the trade unions, but has already decided what will be the modifications! the employer will have to give a reason for the dismissal, which is totally different than to justify it. There are very specific rules about dismissals, but he did not say that they would be applied for the CPE.